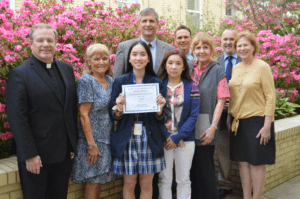 Immaculate Conception Cathedral School junior Maria Nguyen has been selected to receive the Herman Albert and Bernice Agnes Remmert Scholarship Award for the 2019-20 academic year. The $1750 scholarship is awarded annually to Catholic school junior or seniors with career plans in government, business, science, art or engineering. Selection criteria include GPA, student essay, and school recommendation.